Greet your guests with this pleasant looking outdoor set that will not only surprise them but will also tempt them to sink in to it. You can now invite your friends for coffee or enjoy cozy mornings with your family sitting on this lounge set. Its simple yet pleasant appeal will surely be admired by everyone and it will let you enjoy the beauties of nature too. Greet your guests with this pleasant looking outdoor set that will not only surprise them but will also tempt them to sink in to it. You can now invite your friends for coffee or enjoy cozy mornings with your family sitting on this lounge set. Its simple yet pleasant appeal will surely be admired by everyone and it will let you enjoy the beauties of nature too. *Accent cushion not included. This set comprises of:- 1 double seater sofa, 2 single seater sofas, 2 ottomans and 1 center table. 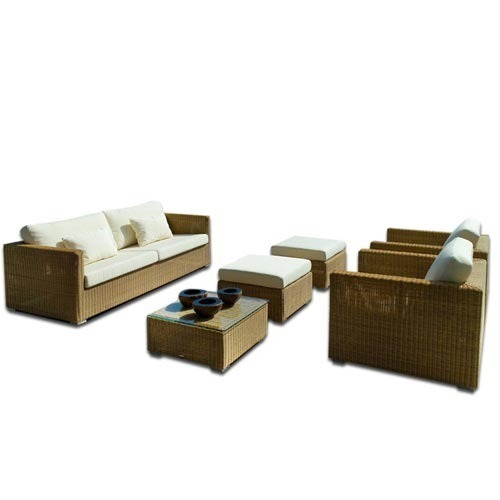 Product Features:- Sophisticated contemporary design and modern materials merge with the natural look and feel of handwoven rattan to create a product that is both timeless and traditional yet resistant to the elements. Carefully constructed using a combination of cutting edge technology and traditional craftsmanship,this piece features the highest quality synthetic wicker handwoven around a sturdy Aluminium frame ensuring your enjoyment for years to come. Light weight powder coated Aluminium framing blends strength, durability and resistance against rust to ensure a product that is functional and enduring. Hand woven synthetic wicker gives you the best of both worlds. The natural look and feel of natural fibre that also offers s UV protection and resistance to fading, peeling and cracking. Covering - High Grade PE Resin Wicker, UV protected and coloured to the core. Frame - Fully welded, powdercoated Aluminium frames. Cushion - 32 density sleepwell foam in 2", 3" & 4" thickness. Fabric - weather resistant fabric. Water, stain and rotting resistant fabric cushions. Glass - Toughend. Our Furniture Expert Rupesh Pandit on Svelte Svelte Furniture Pvt Ltd. is a lifestyle luxury brand based in India, producing superior quality outdoor furniture. Created with innate luxury, imagination, and comfort.Chic, elegant and contemporary, Svelte Furnitures is an all-unique,sophisticated exterior-interior design or decorative theme concept providers. Pepperfry.com is an Indian lifestyle e-commerce marketplace headquartered in Mumbai, India. It opened for business on 3rd Jan 2012 offering a diverse selection of products across multiple lifestyle categories. These products are also examined on set industry standards to eradicate all the flaws. Our clients, as per their demand can avail these in both customized as well as in standard specifications.